: the state of being other or different; otherness. Exploring the effects and ramifications of domestic violence through dance, Kayla Wegley, Ozark, Missouri sophomore, brought “Alterity” to life. 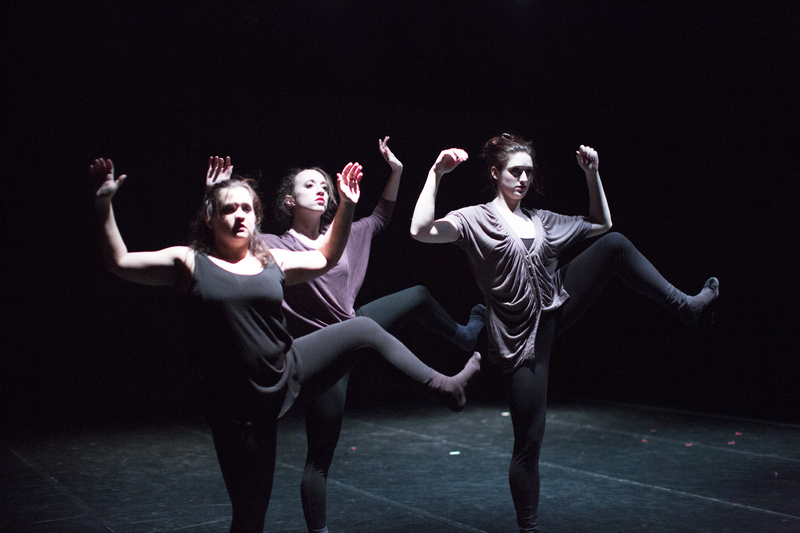 “Alterity” was an evening-length dance concert produced and curated by Wegley around domestic violence and abuse. Wegley felt that choreography could give a voice to a very dark topic and could be examined in a new light through art. Producing and choreographing an entire show is an incredibly intensive undertaking. Wegley sought funding for her project and received both a Student Interdisciplinary Research Grant from the School of the Arts and an Undergraduate Research Grant from the KU Office of Undergraduate Research. “Producing was an amazing learning opportunity. It was a lot of work, but it exposed facets of myself I did not even know I was capable of doing the kind of work I did,” Wegley said. The additional funding received allowed what Wegley initially envisioned as one choreographed piece to become a show featuring nine different pieces of student choreography performed by students in the Department of Dance. Although the subject matter was so serious, Wegley acknowledged that the students participating in the project on all levels really elevated this production to something so much larger than she ever imagined. Wegley is thrilled with the experience she received. “Alterity” is the kind of real-world, practical career experience that has already changed her outlook on performance, choreography, community engagement and career path. Wegley doesn’t currently have any future plans for “Alterity,” but was thrilled that one of the pieces choreographed by fellow dancer, Brennon Madrid, was performed at the University Dance Company’s spring concert.